Travis back with more Tampa Bay area events at the David A Straz Center for the Performing Arts. 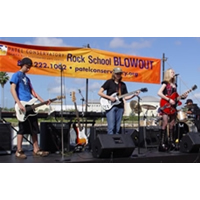 The Patel Conservatory will have its Rock School Blowout on March 27 (Saturday) at 1pm...and it&apos;s FREE to attend, so listen up! Rock school bands, with members from age 10 to adult, rock downtown Tampa when they play on TBPAC&apos;s Riverwalk. Bring a blanket and sit on the grass while the Patel Conservatory student musicians rock your world! It starts at 1pm, so get there early for a good seat! Just head over to www.tbpac.org to get more details, but just make sure you show up! We&apos;ll see you back here for more things to do in Tampa Bay and Tampa Bay entertainment options.